Most of our PowerPoint maps are created as PowerPoint graphics so they can be easily edited and customized in your own PowerPoint presentation slides. After you download any of our world map templates for PowerPoint or country maps you can open them in PowerPoint and then operate with shapes to change properties like color shadows, special effects or just isolate any specific region or location. In order to customize our map PowerPoint template designs start opening the presentation map template and then follow the instructions below. First, you’d need to ungroup the shapes. 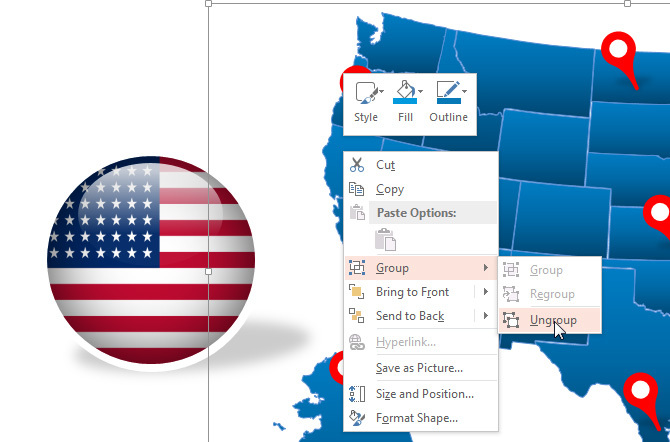 To ungroup the shapes, right click over the map illustration and then look for Group -> Ungroup menu option displayed in the popup menu (the screenshot below shows this option in PowerPoint 2013 but it is also available in other versions of PowerPoint). 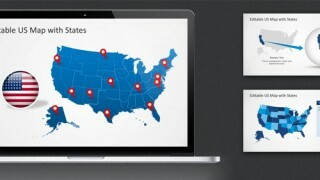 This action will isolate the individual shapes available in the PowerPoint graphic. 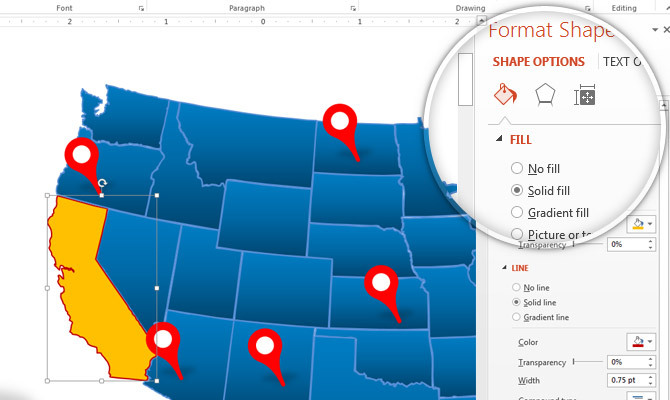 Now, select the map element or shape you want to edit and customize. 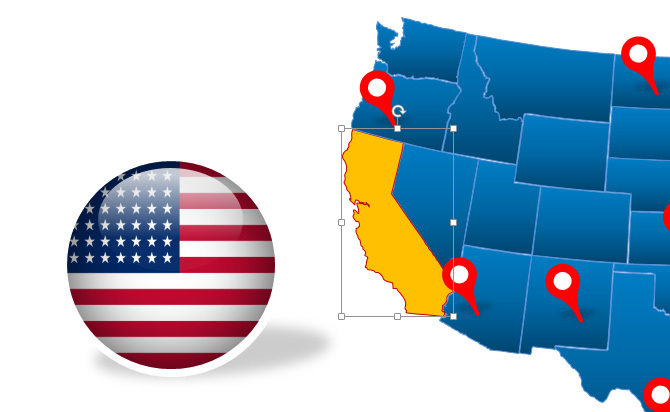 For example, you can select any desired State in US that you want to highlight like California State. Once the shape is selected you can edit the shape properties form the Format Shape pane in PowerPoint 2013 or the Format Shape dialog in PowerPoint 2010. In this example we have changed the fill options and outline style to fill the shape with an orange fill color and replace the blue line by red. The final shape will look as follows. Now you can Regroup the shapes together to combine all the shapes in the same original group of illustrations or copy and paste the shape into any other slide. Working with shapes in this way has a lot of benefits. You can enhance your presentations and save space at the same time because shapes use vectorized data instead of bitmaps (that normally requires a big file size for this kind of map graphics) but also you can avoid losing image quality while resizing the objects. If you need editable maps for PowerPoint you can browse our gallery containing hundreds of editable map templates for presentations including global & world maps but also country maps and popular regional map.